A little bit of history: – Coronation Blue. A photographer and an unopened, 65yr old bottle of ink,travelling and meeting Writers and Artists,celebrating in co-creation. I was recently lucky enough to rescue a large and unopened bottle of “Coronation Blue” Ink-a quart in size, produced 65 years ago. This bottle had probably spent its’ entire existence at the back of a school or office stationery cupboard, gathering dust, just waiting to be used as the lifeblood of some young creative’s imaginative musings. I couldn’t stand the thought of this bottle of as yet uncreated Art being thrown into a skip, so decided to build a collaborative project around it, by inviting as many Artistic friends as I could, to each take it in turns to take custodianship of the bottle and its’ contents, create something vibrant and meaningful with it, then pass it on to other like minds, so they may do the same. My initial intention was to get all of the Art and Writing collected back here in Wales, and to have an exhibition based on the bottle’s journey and its’ meeting with creative minds, all over the world. I now realise that rather than just being the creator of the idea, I also want to create something meaningful in the project and intend to visit my fellow collaborators and photograph and interview each in turn, and ultimately intend to produce a documentary and book based on this global Art project. 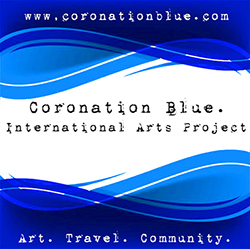 Prev Post: “Coronation Blue” the viral ink art project.